Jewish resistance under the Nazi rule took various forms of organized underground activities conducted against German occupation regimes in Europe by Jews during World War II. According to historian Yehuda Bauer, Jewish resistance was defined as actions that were taken against all laws and actions acted by Germans. The term is particularly connected with the Holocaust and includes a multitude of different social responses by those oppressed, as well as both passive and armed resistance conducted by Jews themselves. Due to military strength of Nazi Germany and its allies, as well as the administrative system of ghettoization and the hostility of various sections of the civilian population, few Jews were able to effectively resist the Final Solution militarily. Nevertheless, there are many cases of attempts at resistance in one form or another including over a hundred armed Jewish uprisings. 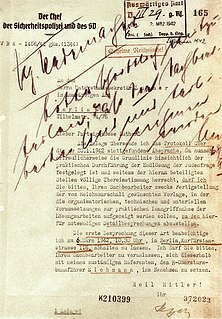 Historiographically, the study of Jewish resistance to German rule is considered an important aspect of the study of the Holocaust. Julian Timothy Jackson is a prominent British historian. He is a Fellow of the British Academy and of the Royal Historical Society. Professor of History at Queen Mary, University of London Julian Jackson is one of the leading authorities on twentieth-century France. A ghetto is a part of a city in which members of a minority group live, typically as a result of social, legal, or economic pressure. 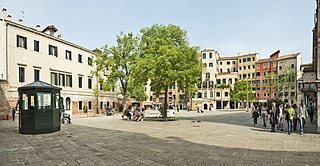 The term was originally used in Venice to describe the part of the city to which Jews were restricted and segregated. However, early societies may have formed their own versions of the same structure; words resembling "ghetto" appear in the Hebrew, Yiddish, Italian, Germanic, Old French, and Latin languages. Ghettos in many cities have also been nicknamed "the hood", colloquial slang for neighborhood. Versions of ghettos appear across the world, each with their own names, classifications, and groupings of people. The British Army trained 37 Jewish volunteers from Mandate Palestine to parachute into Europe in an attempt to organize resistance. The most famous member of this group was Hannah Szenes. She was parachuted into Yugoslavia to assist in the rescue of Hungarian Jews about to be deported to the German death camp at Auschwitz. Szenes was arrested at the Hungarian border, then imprisoned and tortured, but refused to reveal details of her mission. She was eventually tried and executed by firing squad. She is regarded as a national heroine in Israel. 1 2 Jewish Partisan Education Foundation, Accessed 22 December 2013. ↑ Jackson, Julian (2001). France: The Dark Years, 1940–1944 (1st ed.). Oxford: Oxford University Press. p. 367. ISBN 978-0-19-820706-1. ↑ Gilbert, Martin. "The Holocaust: The Jewish Tragedy". London: St Edmundsbury Press 1986. ↑ (in English) David Wdowiński (1963). And we are not saved. New York: Philosophical Library. p. 222. ISBN 978-0-8022-2486-6. Note: Chariton and Lazar were never co-authors of Wdowiński's memoir. Wdowiński is considered the "single author." ↑ Omer-Man, Michael. 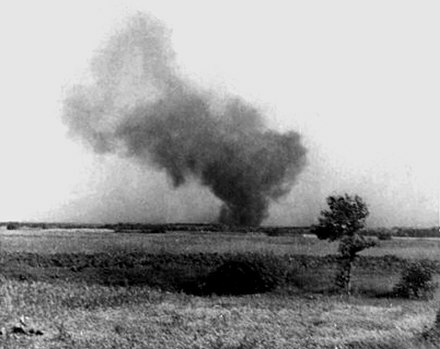 "This Week in History: Prisoners revolt at Treblinka" Jerusalem Post, Aug. 5, 2011. Accessed 23 December 2013. ↑ Raschke, Richard. 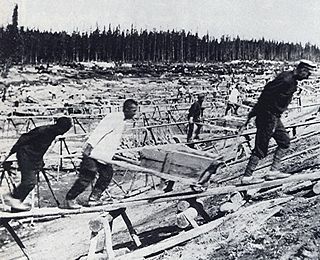 Escape from Sobibor. New York: Avon, 1982. 1 2 Gotovich, José (1998). "Resistance Movements and the Jewish Question". In Michman, Dan. Belgium and the Holocaust: Jews, Belgians, Germans (2nd ed.). Jerusalem: Yad Vashem. p. 274. ISBN 978-965-308-068-3. 1 2 3 Yahil, Leni (1991). The Holocaust: The Fate of European Jewry, 1932–1945. Studies in Jewish History (Reprint (trans.) ed.). Oxford: Oxford University Press. p. 394. ISBN 978-0-19-504523-9. ↑ Williams, Althea; Ehrlich, Sarah (19 April 2013). "Escaping the train to Auschwitz". BBC News . Retrieved 22 April 2013. ↑ Various (1991). "Préface". Partisans Armés Juifs, 38 Témoignages. Brussels: Les Enfants des Partisans Juifs de Belgique. ↑ Yahil, Leni (1991). The Holocaust: The Fate of European Jewry, 1932–1945. Studies in Jewish History (Reprint (trans.) ed.). Oxford: Oxford University Press. p. 436. ISBN 978-0-19-504523-9. ↑ Gotovich, José (1998). "Resistance Movements and the Jewish Question". In Michman, Dan. Belgium and the Holocaust: Jews, Belgians, Germans (2nd ed.). Jerusalem: Yad Vashem. pp. 281–2. ISBN 978-965-308-068-3. 1 2 Yahil, Leni (1991). 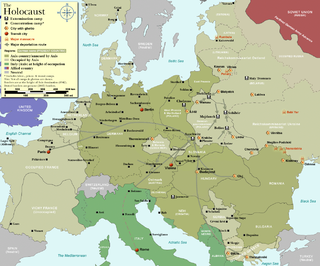 The Holocaust: The Fate of European Jewry, 1932–1945. Studies in Jewish History (Reprint (trans.) ed.). Oxford: Oxford University Press. p. 393. ISBN 978-0-19-504523-9. ↑ Schreiber, Marion (2003). The Twentieth Train: the True Story of the Ambush of the Death Train to Auschwitz (1st US ed.). New York: Grove Press. p. 72. ISBN 978-0-8021-1766-3. 1 2 Schreiber, Marion (2003). The Twentieth Train: the True Story of the Ambush of the Death Train to Auschwitz (1st US ed.). New York: Grove Press. pp. 73–5. ISBN 978-0-8021-1766-3. ↑ Ruby Rohrlich, ed. Resisting the Holocaust. Oxford and New York: Berg Publishers, 1998. ↑ See, e.g., Herbert Lindenberger. Heroic Or Foolish? The 1942 Bombing of a Nazi Anti-Soviet Exhibit. Telos. 135 (Summer 2006):127–154. 1 2 Hecht, Ben. Perfidy, first published by Julian Messner, 1961; this edition Milah Press, 1997, pp. 118-133. Hecht cites Bar Adon, Dorothy and Pessach. The Seven who Fell. Sefer Press, 1947, and "The Return of Hanna Senesh" in Pioneer Woman, XXV, No. 5, May 1950. ↑ "'We proved to the world that we can fight' - Local Israel - Jerusalem Post". ↑ Aharon Brandes (1959) . "The demise of the Jews in Western Poland". In the Bunkers. A Memorial to the Jewish Community of Będzin (in Hebrew and Yiddish). Translated by Lance Ackerfeld. pp. 364–365 – via Jewishgen.org. ↑ Freedland, Jonathan (2008-07-25). "The Jewish avengers who survived the death camps and tracked down their tormentors". The Guardian. Wikimedia Commons has media related to Jewish resistance to Holocaust . The Warsaw Ghetto was the largest of all the Jewish ghettos in German-occupied Europe during World War II. It was established by the German authorities in November 1940; within the new General Government territory of German-occupied Poland. There were over 400,000 Jews imprisoned there, at an area of 3.4 km2 (1.3 sq mi), with an average of 9.2 persons per room, barely subsisting on meager food rations. From the Warsaw Ghetto, Jews were deported to Nazi concentration camps and mass-killing centers. In the summer of 1942 at least 254,000 Ghetto residents were sent to the Treblinka extermination camp during Großaktion Warschau under the guise of "resettlement in the East" over the course of the summer. 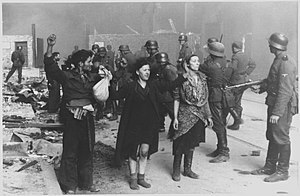 The ghetto was demolished by the Germans in May 1943 after the Warsaw Ghetto Uprisings which had temporarily halted the deportations. The total death toll among the Jewish inhabitants of the Ghetto is estimated to be at least 300,000 killed by bullet or gas, combined with 92,000 victims of rampant hunger and hunger-related diseases, the Warsaw Ghetto Uprising, and the casualties of the final destruction of the Ghetto. The ghetto uprisings during World War II were a series of armed revolts against the regime of Nazi Germany between 1941 and 1943 in the newly established Jewish ghettos across Nazi-occupied Europe. Following the German and Soviet invasion of Poland in September 1939, Polish Jews were targeted from the outset. Within months inside occupied Poland, the Germans created hundreds of ghettos in which they forced the Jews to live. The new ghettos were part of the German official policy of removing Jews from public life with the aim of economic exploitation. The combination of excess numbers of inmates, unsanitary conditions and lack of food resulted in a high death rate among them. In most cities the Jewish underground resistance movements developed almost instantly, although ghettoization had severely limited their access to resources. The Jewish Combat Organization was a World War II resistance movement in occupied Poland, which was instrumental in engineering the Warsaw Ghetto Uprising. ŻOB took part in a number of other resistance activities as well. The Warsaw Ghetto Uprising was the 1943 act of Jewish resistance in the Warsaw Ghetto in German-occupied Poland during World War II to oppose Nazi Germany's final effort to transport the remaining ghetto population to Majdanek and Treblinka concentration camps. After the Grossaktion Warsaw of summer 1942, in which more than a quarter of a million Jews were deported from the ghetto to Treblinka and murdered, the remaining Jews began to build bunkers and smuggle weapons and explosives into the ghetto. The left-wing Jewish Combat Organization (ŻOB) and right-wing Jewish Military Union (ŻZW) formed and began to train. However, only the ŻZW received logistical support from the similarly right-leaning Polish Home Army. A small resistance effort to another roundup in January 1943 was partially successful and spurred the Polish groups to support the Jews in earnest. The Białystok Ghetto uprising was an insurrection in the Jewish Białystok Ghetto against the Nazi German occupation authorities during World War II. The uprising was launched on the night of August 16, 1943 and was the second-largest ghetto uprising organized in Nazi-occupied Poland after the Warsaw Ghetto Uprising of April–May 1943. It was led by the Anti-Fascist Military Organisation, a branch of the Warsaw Anti-Fascist Bloc. Ferdinand von Sammern-Frankenegg was a German SS functionary during the Nazi era. He served in World War I; and postwar in the Freikorps Oberland and the Steirischer Heimatschutz. He served as SS and Police Leader of the Warsaw area in German occupied Poland from 1941 until 1943 during World War II. Jewish partisans were fighters in irregular military groups participating in the Jewish resistance movement against Nazi Germany and its collaborators during World War II. In three cases, entire countries resisted the deportation of their Jewish population during the Holocaust. In other countries, notable individuals or communities created resistance during the Holocaust which helped the Jews escape some concentration camps. Leon Feldhendler was a Polish Jewish resistance fighter known for his role in organizing the 1943 prisoner uprising at the Sobibor extermination camp together with Alexander Pechersky. Prior to his deportation to Sobibor, Feldhendler had been head of the Judenrat in his village of Żółkiewka, Lublin Voivodeship, in German-occupied Poland. 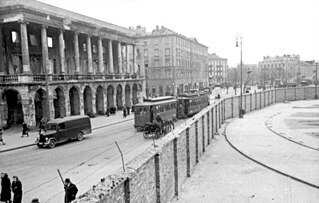 The Grossaktion or Gross-Aktion Warsaw was a Nazi German operation of the deportation and mass murder of Jews from the Warsaw Ghetto beginning 22 July 1942. During the Grossaktion Jews were terrorized in daily round-ups, marched through the ghetto, and assembled at the Umschlagplatz station square for the so-called "resettlement to the East" (Umsiedlung). 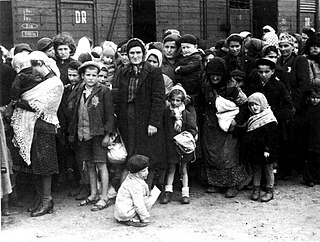 From there, they were sent aboard overcrowded Holocaust trains to the extermination camp in Treblinka. Berek Lajcher was a Jewish physician and social activist from Wyszków before the Holocaust in Poland, remembered for his leadership in the prisoner uprising at Treblinka extermination camp. More than 800,000 Jews, as well as unknown numbers of Romani people, were murdered at Treblinka in the course of Operation Reinhard in World War II. Frumka Płotnicka was a Polish Jewish resistance fighter during World War II; activist of the Jewish Fighting Organization (ŻOB) and member of the Labour Zionist organization Dror. She was one of the organizers of self-defence in the Warsaw Ghetto, and participant in the military preparations for the Warsaw Ghetto Uprising. Following the liquidation of the Ghetto, Płotnicka relocated to the Dąbrowa Basin in southern Poland. On the advice of Mordechai Anielewicz, Płotnicka organized a local chapter of ŻOB in Będzin with the active participation of Józef and Bolesław Kożuch as well as Cwi (Tzvi) Brandes, and soon thereafter witnessed the murderous liquidation of both Sosnowiec and Będzin Ghettos by the German authorities. A well-known photograph depicts three Jewish women who fought in the Warsaw Ghetto Uprising, took shelter in a bunker with a weapons cache, and were forced out by SS soldiers. One of the women, Bluma Wyszogrodzka (center), was shot. The other two, Małka Zdrojewicz (right) and Rachela Wyszogrodzka (left) were marched to the Umschlagplatz and deported to Majdanek concentration camp, where Wyszogrodzka was murdered. Jürgen Stroop, the SS officer who commanded the suppression of the uprising, admired the bravery of female combatants and included the photograph in one of the copies of his official report. The photograph has become symbolic of Jewish resistance to the Holocaust.